Particle physics normally goes hand-in-hand with giant subterranean research facilities and data-processing measured in petaflops. But if you don’t have a research grant the size of Latvia’s GDP, investigating the wonders of subatomic particles can be kinda difficult. Detecting muons, subatomic particles that are the heavy cousins of electrons, requires a ring-imaging Cherenkov detector — and, like most physics equipment named after Soviet scientists, those don’t come cheap. The solution for three undergrads? 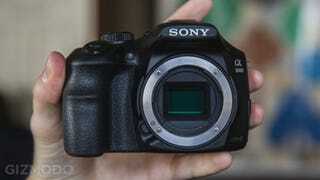 Hack together their own from a Sony A3000, chosen for its large CMOS sensor. The key to turning a mirrorless camera into a RICH detector, apparently, is to replace the lens with a chunk of magnesium fluoride. The magnesium fluoride slows down light passing through it, to the point where muons travel faster than light in that medium. Doing so produced Cherenkov radiation, which shows up on the camera sensor as a cone of light. And all without having to dig a 17-mile tunnel under Switzerland.